According to the federal Centers For Disease Control and Prevention (CDC), cigarette smoking is the leading preventable cause of death in the United States, responsible for 443,000 deaths annually. An estimated 49,000 deaths are the result of secondhand smoke exposure. In Anne Arundel County, about 1 in 5 adults and teens smokes. No wonder lung cancer is the County’s leading cancer killer. What can you do to quit or help someone you know quit smoking? Order or download a FREE Quit Smoking Kit or call the Learn To Live Line at 410-222-7979 for information on any of the following resources. Send a friend an e-mail about the dangers of cigars. This page provides information about cigars and how they are just as addictive as cigarettes and are not a safe alternative. Order or download FREE quit smoking referral cards. Distribute them in your community to encourage people to seek more information about our quit smoking classes and information. Sign up for a quit smoking program. People 18 or older who live, work or attend school in Anne Arundel County can get free help to quit smoking. The following programs offer free counseling and quit smoking aids. You must attend counseling sessions to receive quit smoking aids. Class details are subject to change; call the programs for updates. Call to register or for more information, 410-777-2480. Call to register or for more information, 443-481-4000 or 1-800-MD-NURSE. Call to register or for more information, 410-553-8103. Call to register or for more information, 410-867-4700. Call or go to the Maryland Tobacco Quitline at 1-800-QUIT-NOW. This resource provides FREE 24/7 quit smoking counseling services over the phone and online, as well as a text support program. Nicotine replacement therapy is offered by mail through phone and online support programs. Support is available in English and Spanish. Services are available for teens and pregnant women also. Get support to get you through the day. Click here for more information on signing up for SmokefreeTXT, the free mobile service. Click here for more information on downloading the Smokefree QuitGuide, the free smartphone application. Both offer 24/7 encouragement, advice and tips to help smokers stop smoking for good. Smokefree.gov tools can be used in conjunction with free quit smoking classes and the Maryland Tobacco Quitline. Help kids say no to tobacco. It’s vital to teach kids early to avoid cigarettes and chewing tobacco. The Learn To Live campaign’s Smoking Stinks! program offers free materials, such as posters, stickers and education booklets, plus speakers for youth and adult groups. For parents, order or download the Don’t Let Us Get Hooked on Tobacco booklet that gives you tips on raising tobacco-free kids. For teens who already smoke, check out the interactive online Quit Smoking Kit that can help them stop smoking on their own. Save yourself and your family from environmental tobacco smoke! Secondhand smoke and thirdhand smoke are harmful to your family and are associated with several illnesses. Learn six ways to protect your family today. Order or download a free copy of Save Yourself and Your Family from Environmental Tobacco Smoke. Get tips to help you quit. The award-winning Roadmap to Quitting workbook can be viewed and printed as a PDF document. Also see the Power to Quit booklet, a guide to help African Americans stop smoking. You need Adobe Acrobat Reader installed on your system to view the documents. If you do not have Adobe Acrobat Reader, click here to download. 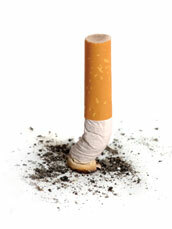 Get more information on avoiding or ending tobacco use. The U.S. Department of Health and Human Services has launched a new one-stop access site, BeTobaccoFree.gov, offering the best and most up-to-date tobacco-related information. This resource offers general information on tobacco, as well as federal and state laws and policies, health statistics and evidence-based methods on how to quit. View these websites for more information about smoking cessation and tobacco use prevention. Smokers and Asthmatics 19-64 Years Old, Get Immunized Against Pneumococcal Disease (PDF).